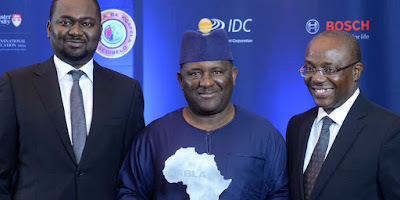 Foremost billionaire businessman and Nigeria’s fourth richest man according to Forbes, Abdulsamad Rabiu has been nominated for the 2017 West Africa Business Leader of the year at the 2017 CNBC/All African Business Leaders Award. Rabiu, CEO/Founder of BUA Group, a Nigerian food and infrastructure conglomerate was named alongside other CEOs such as Jennifer Bash, the CEO AKTZ industries, and Mwaura Ndichu, the CEO Interswitch GRP, Joyce-Ann Jawainaina, the CEO of Citi bank who are also in contention for various regional awards. The Executive Chairman/CEO, BUA Group who in 2016 won the CBNC/AABLA African Industrialist of the Year Award was among finalists for this year’s award barely a month after commissioning BUA Cement $1 billion plant in Edo State and signing a $500 million textile cluster agreement in Katsina State. The nomination process for the annual event in partnership with CNBC Africa began on September 14, and ended on September 20, 2017 with recognition of excellence across categories including: Young Business Leader of the Year; Entrepreneur of the Year; Business Woman of the Year; Innovator of the Year; Industrialist of the Year; Company of the Year; Business Leader of the Year and Philanthropist of the Year. The AABLA honours remarkable leadership and salutes game changers of business on the continent for their continuing commitment to excellence, developing best practices and innovative strategies. Winners of the Awards exemplify the best in African leadership. They epitomize the core values of a successful leader, strength, innovation, ingenuity, knowledge and foresight – values that are imperative to carving out powerful business in a Pan-African and global economy.